As we approach the final few days of our Second Session, more and more special events appear on the calendar. 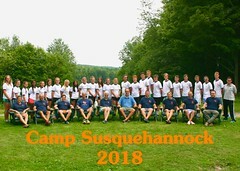 The girls of S4G paired off and dressed up on Twin Day, both Camps were represented during the Horse Show, the youngest cabins visited Chocolates By Leopold in nearby Montrose, PA, and the Boys held the Gold Medal Decathlon. As the soothing sounds of Toto’s “Africa” emanated, campers from S4B and S4G gathered for a special activity called Serengeti Plains on Wednesday, July 31st. Teams called herds named after various species indigenous to Africa complete various Challenge Course-style stations around the entire campus. Herds get points for successfully completing each activity. The herds may complete a station two times, but not consecutively and with a modification to make the second attempt more difficult. Every member of each herd is responsible for guarding a “tail” that is tucked into the back of their shorts. Predators roam the plain and will engage herds as they travel from station to station. Team members can still participate in the events after losing their tail, but if the entire herd loses all the tails it becomes extinct. To combat this, herds can win tails back by locating the Wise Sage and correctly answering Camp trivia questions. Teams may also win back tails by catching the Poacher who is also roaming the Plains. The members of S4B cabins Tumble Inn, Palais Royale and Pepper Box made history on Monday, July 29 by participating in a new game based on the “American Gladiators” television game show. Campers negotiated an obstacle course while dodging balls thrown by the opponent. If hit by a ball, campers started over at the beginning of the course during a three minute period. This game was a magnificent success as you can plainly see from the smiles of all participants! Campers at S4B and S4G have settled into an action-packed groove during Second Session! The girls continued their exciting Orange and Blue competition and took a special Three Hour Tour at the Waterfront after building rafts. Some of the Boys Camp visited nearby Creek Bend for Miniature Golf and went fishing, while campers of all ages competed in Orange and Blue games on the fields and courts. To complement the Fourth of the July Field Days hosted by S4B during First Session, the Girls Camp welcomed the boys down the hill for Second Session Olympics on Thursday, July 26th. Campers of both Camps were assigned countries by cabin and participated in a number of events around the Girls facilities. Both the action and the fun continued as the first week of Second Session of 2013 moved along. 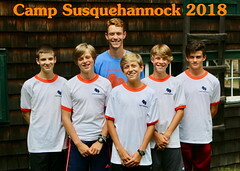 The Men of Susquehannock received instruction in a wide array of sports on the fields and courts, while the ladies from S4G were treated to special Lacrosse clinics led by Kim Richter of FILIA Sports and an evening on the Climbing Tower. After an exciting Opening Day, both Camps spent the first few days of Second Session playing the World Games. 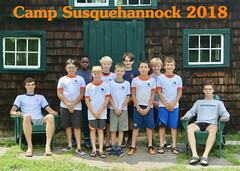 In order to create balanced teams for the on-going Orange and Blue competition, campers are evaluated during these Games. Creativity and sportsmanship were on full display during the World Games Team Cheer Competition at S4G. Up the hill, the boys began receiving expert instruction on the fields and courts during Team Clinics. After a memorable First Session and brief yet fun Midseason (photos forthcoming), the staff prepared for a large batch of new arrivals on July 18th. The late morning and afternoon was spent checking in with the Main Office and Infirmary and moving into cabins. Many people shared the observation that they never had seen so many cars at once on the hilltop! Co-Site Directors Win and Cannie Shafer officially kicked off Second Session during an evening meeting in the Main Lodge at the Boys Camp. 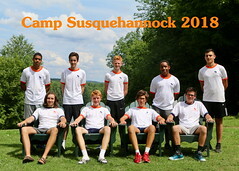 The S4B and S4G staff members introduced themselves and helped go over important details about Camp life. The respective Camps then separated for their own opening day festivities and the fun started! 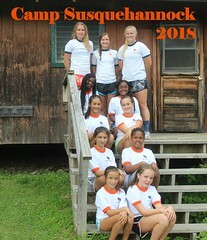 On Monday evening, the girls of Susquehannock took part in Cabin Skits which is always a memorable ice breaker activity at the beginning of the session! 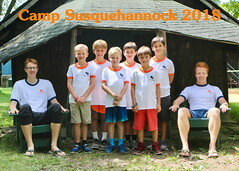 A treasure trove of highlights from First Session including: Clinics, a trip to a Binghamton Mets baseball game, S4G Cabin Skit Night, the Organic Garden, S4B Regatta, S4G Twin Day and S4B Gigantusball. Check back as this Set will updated frequently with more photos as they become available.